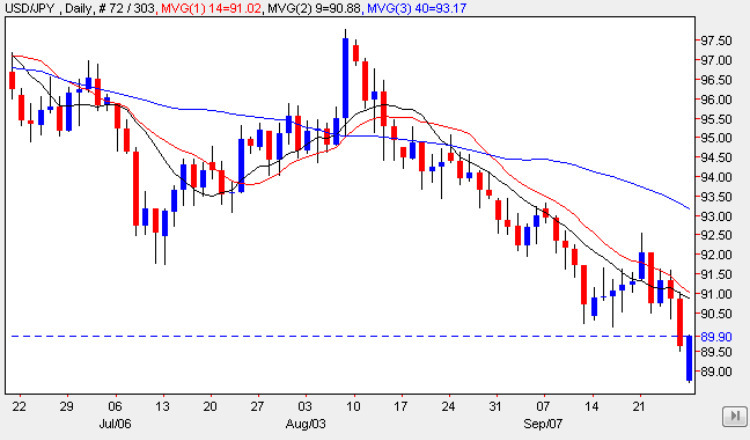 An interesting day for the dollar yen yesterday, which opened the trading session gapped down on a falling window, and adding further to the bearish sentiment for the pair which was emphasised on Friday with a wide spread down candle which closed well below all three moving averages. Whilst prices moved up during the trading session, the gap down move has reinforced the bearish view for the yen to dollar pair at present, and as outlined in last week’s market commentary, my initial price target for the pair was at 0.88 which is now close to being achieved. The problem now will be whether the yen to dollar pair is able to find any traction at this level as we are now deep in the consolidation area created early in the year. If so then we could see the pair consolidate at this price level for some time as this may provide the necessary platform for a move higher, which is why I suggested this region as my original price target for the downwards move. However, of this region is breached, then we should see th pair move subsatbtially lower, possibly even as far as the 0.86 level. The present bearish sentiment has also been given a boost by Japan’s finance minister whose recent comments regarding BOJ intervention (or lack of) were seized on by the forex market and acted on accordingly. The main fundamental news on the economic calendar for the yen to dollar overnight was the release of the Tokyo Core CPI numbers along with the National Core CPI data, with the first forecast at -2.0% and the second at -2.3%, both of which are sligthly worse than last time, with both coming in at -2.1% & -2.4% respectively. The other principle item of fundamental news of the curency pair will be the CB Consumer Confidence data released later today in the US, with a forecast of 57 against a previous of 54.1, so an improving picture for the economy once again.